I suspect bug 284572 is a duplicate of this bug. But I'm not sure which way to merge them. Bug 284572 has most of the data while this one has already 4 duplicates and seems to be the target for automatically generated bug reports. Any suggestions? Marking bug 284572 as a duplicate of this one. tomek.bury: you can add a comment here linking to the most relevant comments from the other bug. Perhaps NAS drive tells fibs (package with wrong info level, ommisions, aditions, mistakes? The patch revealed another problem - lots of the files became invisible when I'm trying to access them via samba, but I still can access them when I plug the drive directly in using USB cable. I tracked down the problem to the following lines in "clilist.c" function "interpret_long_filename". Same problem here with a Conceptronic CH3DNAS NAS disk. Please could someone give a workaroud? it seem to work, but not in my case. I'm terribly sorry to ask some information about patch. 1st. Could you publish a mini (really mini) HowTo? Any to uninstall first??? 2nd. Could you please what could kind side-effects are expected to appear, and how to reverse samba situation to actual "as is". I guess that reinstalling smbclient and smbfs will be enough. I'm very greateful for your help. I'll do a simpler patch just removing the offset check Marcus talks about in comment 10. Apparently the affected NAS use info level 1 (which is usually used by OS/2) !? Stay tuned. Seems to work fine and without crashes so far. So something is still wrong with Samba, at least on my Intrepid desktop. I am going to revert back to release Samba package for Intrepid and see what smbclient does and see if I can at least get ftp to the NAS working again. 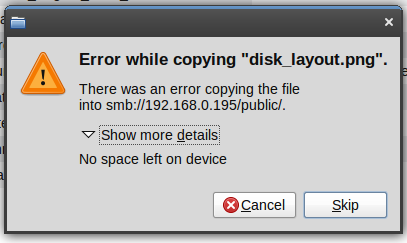 There was an error copying the file into smb://192.168.0.198/ubuntu/. Maybe that is how Nautilus interprets ERRHRD -39 ? The NAS disk is 500GB with lots of room. I would be wary to remove the offset check. I'm not really into that code, but removing it will break offsets when there actually is no name in that Info1 struct. Can anybody provide a tcpdump/wireshark capture file of a smb connection that causes mentioned segfault? Could you please follow instructions given on http://wiki.samba.org/index.php/Capture_Packets and post the corresponding trace for the Samba developers to look at it ? If not installed already, tcpdump can be installed by just running "sudo apt-get install tcpdump". should I capture packets for the broken samba or the one from your ppa that works. Here is a capture from my box, running Ubuntu Ibex, 2.6.27-9-generic #1 SMP i686 GNU/Linux. Samba is 3.2.3, using Iomega Network Hard Drive 350 GB with latest firmware. I remember this worked with Gutsy, I believe the samba version was 3.0.something, unfortunately can't remember what it was. The wireshark capture is for a simple smbclient, logon using blank password, then trying an 'ls' command. @Shawn: the one that fails, preferably. I'll look into this some more tomorrow. This seems to be an issue introduced in Samba 3.2.x. I should be able to write a test case using the network trace. This is tracked in a different Samba bug. Seems like Jeremy Allison pushed a fix for that to git on 2008-12-08 already. However, the reporter of the samba bug is experiencing the same issues as rossjenkins. I'll follow up on that. OK, attached are some files. First a pdf file showing how my network is laid out (1 picture worth 1000 words etc.). Next is a text file of the network capture on eth0 between my Linux comp (ubuntu-test) at ip 192.168.0.100 and my IOmega 500 GB NAS aka "Home Network Hard Drive" via a DLink 615 router. The IOmega NAS is at 192.168.0.195. I used Wireshark for the capture. The last file is the same information but in the Wireshark proprietary format. I am using Samba 2:3.2.3-1ubuntu3.3. I tried to connect to smb://192.168.0.195/PUBLIC/ from Nautilus and it momentarily connects but then Nautilus reverts to displaying my home folder as previous posters have mentioned. The IOmega NAS uses an embedded Linux server of some kind to serve requests. ftp works OK. The pcap dump (i.e. the binary data, not the text file) was pretty much what I needed. Thanks alot. Could anyone try the attached patch on top of current v3-2-test git? I'll try it if you tell me how to do it. Kai Blin: thanks for the patch, I'll build a new package in my PPA for Intrepid with this patch in, for easier user testing. samba - 2:3.2.3-1ubuntu3.4~ppa3 from https://launchpad.net/~tcarrez/+archive is compiled with the patch from Kai Blin on comment 33, for those interested in testing. Read access to my NAS works as expected in Nautilus and read access using smclient in a terminal works. However, a put access (ie write access) using smbclient still returns an ERRHD -39 error as seen in the message below. Also, attempting a write access by dragging a file into the smb:// Nautilus window generates the disk full error message as seen in the attachment. In other words, the latest patch has produced about the same result as the 2:3.2.3-1ubuntu3.4~ppa2 patch. What is common to both smbclient write access and Nautilus write access during a write to a NAS device? Is there any other capture I can do that might help to pinpoint that area? Any idea what ERRHRD -39 might point towards? So, in summary, with the latest patch, read access is OK, write access is still FUBAR. same behavior as last comment with my Conceptronic NAS disk. with patch (only smbclient and smbfs installed) I can now read, but not write. I tested the latest patch (2:3.2.3-1ubuntu3.4~ppa3), my NAS is an Iomega Home Network HD 500gb ( Previewed URL: http://is.gd/bQv1- ). Reading of the hard disk is now working. When writing I get a "No space left on device" error. I can provide more details if necessary. My NAS is firmware upgradable I have tried unsuccessfully to contact Iomega to have a look at this issue. Volker Lendecke's patch seems to have done the trick! Both a write using an smbclient 'put' as well as a drag and drop via Nautilus now work as expected. The visual side effect in Nautilus I noted five messages above is still present but since it doesn't seem to have a bearing on file writing functionality to the NAS I think it can be ignored for now. Using 'get' in smbclient continues to work just fine as well. Worked for me, for read AND write into my Conceptronic NAS disk! > Worked for me, for read AND write into my Conceptronic NAS disk! > Works for me too. > > Worked for me, for read AND write into my Conceptronic NAS disk! > > Good job guys! > This is now fixed in the Samba git trees, will be in the next 3.2. Could you post the final patch ? As requested by Christian, here's a patch for the v3-2-stable tree, applies to both 3.2.5 and 3.2.6 without any problems. Same thing for me, I am sorry to say. smbclient on the commandline gives errormessages. The latest official Ubuntu Samba update regresses the one in Thierry's ppa repository. I used Synaptic Package Manager to force the Samba packages back to the ones from Thierry's ppa and then used Synaptic again to lock those versions so they won't be "upgraded" via Intrepid-Updates again. You might want to do the same. > Updates again. You might want to do the same. against locking to this verson. Ross, this would make your system more insecure, since Thierrys packages don't include the security fixes for the USN mentioned in my comment above. Maybe you still want to do the same, but when posting workarounds, you should always mention the drawbacks. The real solution would be to finally get this fix included in Ubuntu. I'm not sure who's feeling responsible for Samba packages on the Ubuntu side of things. Given that intrepid is on 3.2.3, the patch would have to be backported anyway, so there's no need to wait for the next 3.2 bugfix release. I'm aware that the write patch is kind of large, but at least the segfault is an easy target. > I'm aware that the write patch is kind of large, but at least the segfault is an easy target. Well, yes, but not anymore, the work has been done now.. Since Thierry already made version 3.2.3 packages with this fix included, the Ubuntu Maintainers "just" need to take his patchset and include it into their packages. That's not what I'm talking about. the bigger the patches you pull in, the bigger the risk of regressing other things that used to work. I doubt Thierry's patches have been tested by many people not affected by this bug. While I personally doubt there's a problem for standard setups, I can understand the package maintainer's point of view. Well the patches are from the Samba developer Volker Lendecke, but for version 3.2.5 (or 3.2.6 or such) and have been backported to 3.2.3 by Thierry. So you think that the backporting would cause regressions? As I'm no developer, I have to cope with your opinion here, so thank you for this info. I'm kinda busy those days, but I'll refresh my PPA tomorrow with a 2:3.2.3-1ubuntu3.5~ppa1 that builds on the recent security release. Concerning the official intrepid update, I'll file a SRU report and let the ubuntu-sru powers decide if the fix is worth the regression risk, as this is definitely a complex patch. I welcome Samba developers comments on it though, so as to better describe the regression potential for it. > 2:3.2.3-1ubuntu3.5~ppa1 that builds on the recent security release. be very careful about patches fixing no release-crtical bugs. and I would not push it if it was for Debian stable. Sorry guys, I didn't mean to sound like I was recommending that everyone lock in Thierry's ppa Samba patches without the most recent security fixes. It is a balance between usability and security and in my specific case the usability aspect trumps the security one. I will check out any new updates as they are made available from Intrepid - Updates but if they break my NAS access I will go back to the ppa fixes - I need a functional NAS and I don't want the fuss of going back to Ubuntu 8.04 to get it. samba_3.2.3-1ubuntu3.5~ppa1 should be (if it builds) in my PPA in a few minutes for those wanting to test it. It's using the complete patch from Kai Blin posted on comment 76. The SRU will be based on it if successful. Used your new version now for about 1 hour and have not seen any problem so far. Ditto for me as well - new ppa version working OK as far as I can tell. I installed your packages with the patches for Debian in Ubuntu 8.10 using the Synaptic front end for apt without any problems. I did not change my smb.conf file. The following tests to my IOmega 500 GB Home Network Harddrive (NAS) worked without any problems. 1. Created a test file "test.txt" and using smbclient via a terminal "put" the file into the /public folder of the NAS. 2. Using smbclient, used the "get" command to retrieve "test.txt" and rename it and put it on my desktop as "testret.txt". 3. Using Nautilus under the Gnome desktop opened (mounted) the /public folder on the NAS and dragged the "test.txt" file into it. 4. Deleted the "test.txt" file from the NAS via the Nautilus window. 5. 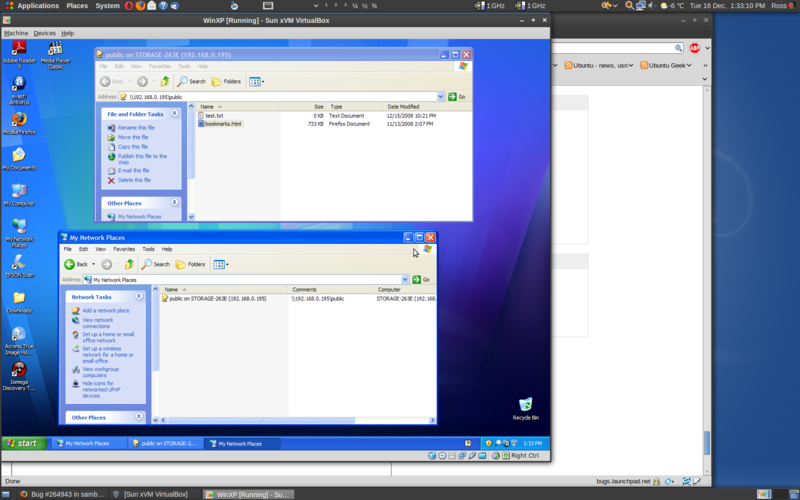 Copied a 700.1 MB avi file from the /public folder of the NAS to the Gnome desktop via Nautilus "drag & drop". All these tests worked OK. I will keep your Samba version for a couple of days to give it some more of a workout, but so far it seems to work the same as the one in Thierry's latest ppa for Ubuntu. Tried these packages as well and so far they are really working great. Using the share with KDE's smb:// kio plugin, uploaded, downloaded, renamed, deleted files from the share. I have tried the smbclient and samba packages and everything seems to be working great thanks. I seem to get odd messages saying the connection does not exist but you click on it a second time and off it goes. I will try and be more precise if needed. I now need to find out how I can make a samba file system connection as seamless as connecting to directory on the computer. The joys of Linux and having so much freedom to play. Thankyou for all your hardwork. > I now need to find out how I can make a samba file system connection as seamless as connecting to directory on the computer. New patch tested in my Conceptronic NAS Disk (CH3DNAS). Accepted samba into intrepid-proposed, please test and give feedback here. Please see https://wiki.ubuntu.com/Testing/EnableProposed for documentation how to enable and use -proposed. Thank you in advance! Please fix ASAP in Jaunty. Thanks! FWIW, this bug is fixed in Debian version 3.2.5-4, so a straightforward merge should take care of it for jaunty. I've just disabled Thierry's ppa and installed samba related packages from intrepid proposed repository - it's all yummy. I can read and write to NAS drive. Could anyone else check the intrepid-proposed version of samba? - setup SAMBA_VERSION_SUFFIX to Ubuntu. the install continue instead of aborting. - Make libwbclient0 replace/conflict with hardy's likewise-open. - Add a 'status' action. - Add a PID variable and a 'status' action. * Fixes LP: #264943 and LP: #286119. I've installed a 9.04 Alpha-3 version onto a VMWare Windows-based-machine, and my NAS disk worked fine with the software just out-of-the-box. Now I tested intrepid-proposed package and now it is working again in nautilus and smbclient. Guys, please submit this to Intrepid official. Thank you all for this effort. I forgot to mention about my test environment. I am using Ubuntu version 8.10 (64bits) on a AMD Turion X2. The package was installed from intrepid-propose and test did with ViPower NAS transferring (to and from) a file from about 4GB over wired network and another file (~2MB) over wireless network (the NAS is connected to mey wireless router by cable, off course). I do also edited a .txt file with gedit direct from NAS using nautilus to find it, open (double click), alter and save (gedit). Thanks ! I guess we are done with verification here, fix publication is waiting on confirmation that bug 286119 is also fixed by the update. from upstream. Thanks to Thierry Carrez for tracking this down. Displaying first 40 and last 40 comments. View all 109 comments or add a comment.